<>, Inspire-O-Gram, "F'ree Christmas novel is here!" F'ree Christmas novel ready for you to download! 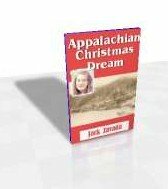 As promised, my Christmas gift to you this year is a brand new inspirational e-novel titled Appalachian Christmas Dream. It's the story of a young, single teacher in the hills of eastern Kentucky in the early 1900s. Junie Corban's dream is to conduct a Moonlight School for the illiterate people of her county, to teach them to read and write. This 88 page f'ree novel is packed with suspense, excitement, romance, and yes, a hope-filled Christmas message. Instead of the usual Thanksgiving theme for this newsletter, I'm offering something a bit different. We singles are usually thankful for what we have, but some things are missing from our lives--most notably a spouse and family. We'll be starting a new year soon, and that can be a difficult time if you look toward the past. We can often make the wrong assumption that our future will be like our past. But it doesn't have to be that way. With God's help, you can take action. You can bring about needed change. You can face tomorrow and the rest of your life with a sense of expectancy and optimism. I'll be honest with you. After a lifetime of disappointments, I don't put my hope in myself, the government, an employer, or even other people any more. I put it in Jesus Christ and him only. If that offends you, then you don't know what I know. If you agree, we're on the same wave length. He gives a love that never changes, a strength that never fails, and a hope that endures through everything. but I'd rather be odd." of love, peace and care. from a touch sweet and kind. when you'd rather be odd. for folks who'd rather be odd." No matter where you live in the world, we're just a few keystrokes away. You can use our hypollergenic contact form. We can't list our e-mail address because it attracts spammers. P-U!! I hope you have a wonderful Thanksgiving, and keep watching Inspire-O-Gram for an exciting announcement about my new ebook, coming after the first of the year. It's a lollapalooza! 'Til next month, God's best to you!